I loved the scent of the Black Cherry Candle! 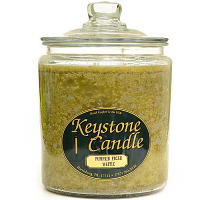 The jar candle burns evenly all the way to the edges of the jar leaving no waste of the candle, it reminds me of the candles I used to buy from Party Lites demonstrations, but the cost of Keystone Candles is way less then Party Lites Candles but the scent is just as strong filling the room I burn it in. Advantages: A large choice of scents at a great price! Disadvantages: I see no disadvantages except maybe the shipping cost, when I used to order from Party Lites there was a cap on shipping no matter who much was ordered.